Agrochemicals, such as pesticides and fertilizers, have facilitated an unprecedented intensification of agriculture [1, 2]. However, the desired yield gains come at the cost of unwanted side effects on the environment. Pesticides have been demonstrated to contribute to the decline of non-target organisms, such as bees, birds and aquatic biodiversity [3–5], fueling the global biodiversity crisis. This runs contrary to global efforts to protect biodiversity and, in particular, also to the aims of the European Union’s (EU) pesticide regulation . Consistent exceedances of regulatory thresholds  and revisions of authorizations of pesticides, such as of neonicotinoid insecticides in the EU by the Standing Committee on plants, animals, food and feed (PAFF Committee), also attest to deficiencies in regulatory pesticide risk assessment and management. If the predicted exposure exceeds the safe concentration (as is the case for 2/3 of insecticides ), a pesticide can still be authorized if the producer can show through further data that its environmental and human health impacts are acceptable . This is formalized as a tiered framework that extends the standard toxicity tests (first tier) to more complex scenarios (higher tiers) . 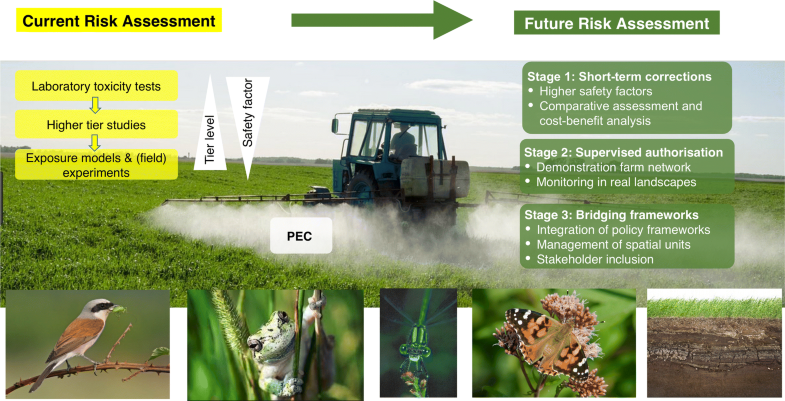 Higher tiers integrate processes and characteristics occurring in natural ecosystems, such as multi-species semi-field test systems in the EU, as well as reduction of exposure through mitigation measures in risk management . The tiered framework relies on two assumptions: (i) the first tier provides an overly protective measure of potential effects in the field; (ii) the higher tiers provide more ecologically relevant predictions of field effects or of concentrations that do not lead to unacceptable effects. Therefore, despite being rewarded with lower safety factors, they are assumed to still be sufficiently protective (Fig. 1). However, the widespread and well-documented occurrence of adverse effects in the field when authorized pesticides are applied (e.g., [3–5, 12–18]) questions these assumptions.